Baritone guitar 28.5" and 30.2"
Accurate fret slots without guesswork. Designed for use with our Fret Slotting Miter Box, or your shop table saw. Each template is made of durable stainless steel and has notches for two different fret scales. Includes an indexing pin and instructions. These templates provide accurate fret positioning for guitar, bass, banjo, mandolin, or ukulele. 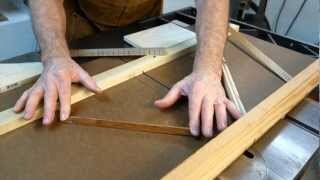 #4914 - #4919 guitar and bass templates allow for 24 fret slots. #4911 baritone and #4912 bass templates provide 22 fret slots. #4920 banjo / mandolin template will locate 22 frets for banjo and 29 for mandolin. #4909 ukulele template will provide locations for 18 frets and the #4910 ukulele template will locate 20 fret slots. "I asked StewMac to develop ukulele fret scale templates because I'm so impressed with their templates for fretting guitars. Based on my experience in industrial product design, I believe StewMac's steel templates are more accurate and robust than acrylic templates, which break easily and become less accurate with use. And each template has two scale lengths for one price, so they're the best value available." #4915 Martin Dreadnought scale is commonly referred to as 25.4" but is actually 25.34". #4916 For Fender 25.5" includes fretboard cut-off and nut positions. Also for 25" scales like Paul Reed Smith®, Dobro®, Danelectro®, and Benedetto. #4914 and #4917 We offer templates for Gibson's 25.3" long scale, plus three shorter Gibson scales. Over the years, Gibson has referred to each of the shorter scales as 24-3/4". For use with a table saw: Install the supplied index pin in the fence of your table saw. Attach a template to the back of the fingerboard. On your table saw, align the blade perpendicular to the fingerboard, and saw the slots with the template side up. We recommend a Fret Slotting Table Saw Blade. For use with a luthier's miter box: Simply attach a template to the back of the fingerboard, and saw each fret slot after locating the index pin (preinstalled in our miter box) in the corresponding template notch. We recommend our Fret Slotting Miter Box. Great template, easy to use, very accurate, happy days. I ordered the two available Ukulele templates to replace the ones that I misplaced years ago. I have not yet used them, but they seem to be very substantial and will last a long time without wearing. I hope to be using them with the Fretting saw and jig that I already have, and to construct a fret making sled to use with the my previously purchaced table saw fret blade. T.C. Excellent quality of machining, Nice etching. I would have attached the indexing pin to the template itself, rather than stappled to the instruction sheet. I almost dumped it. I recently purchased the 24.75" scale to complement my existing 25.5" scale and these templates are fantastic. With my home made miter box i can accurately cut fret slots quickly. My first guitar came out great and now I'm working on my 2nd and 3rd. Best improvement on a product. Much better that the plexi original that broke. These will actually last. Well worth the little extra.! These really are that easy. I guess I'll have to invest in more sizes. What more can I say? This template will outlive me and does exactly what it’s designed for. Didn't realize until reading the instructions for use that the gauge is supposed to be used with a table saw fret cutting blade. No matter, laying out the frets using the notches as a guide resulted in perfect frets. I put a lot of time into making my own template but could I really know if I was on the mark? This thing takes out the uncertainty and puts it in stone, well in this case stainless steal. No more wondering if I got it right! Unless you have a good fretboard your willing to sacrifice just so you can make your own this is well worth the money! It's not going to matter what kind of wood is going into your project if the notes are wrong. This is making a 35" bass neck much easy to work with. Paul Reed Smith® and PRS® are trademarks of Paul Reed Smith Guitars.